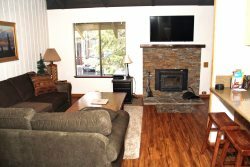 Above Standard, 2 Bedroom & Loft & Three Bath Town home located in the Scenic Meadow area of Mammoth Lakes. Sleeps 8 (approx. 1300 sq. Ft.) .Master has a new king bed (2016) 1st bedroom has a queen bed - new mattress 2016, the loft has four twin beds. The living room has sofa and love-seat but it is not a foldout couch. Four Flat Screen TV`s, DVD and VCR players, stereo. Phone Number in Unit: 760-934-8683 Wireless Internet Provided. New Stove and Refrigerator installed December 2013 You enter the unit on the first floor which has both bedrooms and 2 full bathrooms. The second floor is the living room, kitchen, dining room and 1 full bath.The unit has a wood burning stove. The third floor is the loft (open in to the living room by a half wall).This unit is No Pets and No Smoking but the owners do bring their own pet when they stay. There are a maximum of 2 outdoor parking spaces available. Snowflower Features a Hot Spa and Sauna, Summer Time Only Swimming Pool, and Tennis Court. Coin-operated laundry facilities located in the common area near the office. There are no Buses, Motorhomes, Trailers or any type of Towed Vehicles allowed on the Snowflower property. COMPLIMENTARY INTERNET and CABLE TV are provided, however NO REFUNDS will be given for connectivity problems or Internet failure. TOT LICENSE 807-SF82. Home was nice and in a great location. Very easy picking up and dropping off keys. Amenities were on the older side, but the beds were comfortable & the cabin had everything we needed.